Winter is fast approaching, and it's time to prepare your garden for the long months ahead. Stake and tie up any young trees or shrubs that may break under the weight of wet snow or ice. Use soft (but strong) ties around the bark of trees, as wire or twine can cut into the bark and cause serious damage. Consider old T-shirts cut into strips. Water newly planted conifers and broad-leaved evergreens (such as rhododendrons) until the ground freezes. Wrap the stems of young and newly planted trees with white cloth or white plastic tree wraps. This will help to prevent sun scald on their bark and will also help to protect young plants from damage by rabbits and voles. Dump snow away from shrubs and young trees. Dumping large amounts of snow on trees and shrubs can cause serious damage. In the spring the mounds of snow melt and gradually sink, pulling at branches and leaving salt behind. Alternatively, snow on top of a perennial bed can be a good insulating layer. Don't forget the birds! If you have a bird feeder, make sure that you are dedicated to keeping it filled throughout the winter. 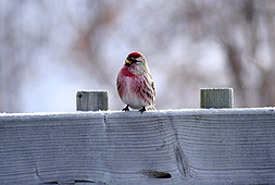 Many wintering birds become dependent on bird feeders during extremely cold or stormy weather. Mulch gardens if you didn't get a chance to do so earlier. When using leaves, do not apply a thickness of more than about 10 centimetres (four inches). Any deeper will smother bulbs and perennials trying to grow in the spring. Find out who has visited your garden this winter. Have some fun and learn to identify animal tracks after a fresh snowfall. In some cases, if you follow their paths in the snow, you may notice shrubs or other plants that they may be eating and can take early steps to protect your garden. Once deciduous trees drop their leaves check them for pests (e.g. scale) or diseases that may have been hidden by summer foliage. It is also a great time to examine the tree to determine if some spring pruning will be needed. As you wind down the garden season, make notes on what worked and what didn't work, to help you plan for a successful garden next year. You are more likely to remember key points now rather than next April or May! Join a local garden or horticultural society. Many organizations meet over the winter on a monthly basis and provide interesting speakers who can help chase away the winter blues and provide you with great ideas for your upcoming garden season.